Megafight is on its way and soon many will want to be a part of the historic event by watching it live on May 3, 2025 (local time). It is expected that the country will once again unite to support Emmanuel "Manny" Dapidran Pacquiao against his rival American boxing Icon Floyd Mayweather, Jr. It does not only appeal to many because the two are the bests in their sports globally but also because of their respective achievements. Pacquiao is an eight-division champion while Mayweather is undisputed pound-for-pound king. Here are some ways to watch the fight for free. If you haven’t heard the news yet, the three giant television networks are converging to simultaneously broadcast the megafight in the country. GMA had been holding the exclusive contract for the broadcasts of Pacquiao’s fights, but the fighter personally asked for the three networks to unite for the special occasion. The airing of the simultaneous broadcast will be slightly delayed while the Solar Sports will be airing the awaited fight on cable. If you are planning to avail a DSL connection just to watch the boxing fight of the century, why not check out the PLDT offer called TRIPLE PLAY Plan ? The TRIPLE PLAY Plan had been recently loaded with a free access to the Pay Per View, but only if you subscribe before April 24. Home DSL Plan 999 with speed of up to 3 Mbps is the lowest budget plan created. This comes with regular fees of installation fee which is Php1100, monthly fee of Php999, and landline monthly service for PHP7000. Just like the past fight of the Filipino boxing icon, the fight is expected to be shown for free in various public places such as plazas, auditorium, and gymnasiums. These are meant to be a public service by politicians so tax payers ought to used the opportunity. These places do not only feature the once in a lifetime fight of the Philippine pride, but also the funniest, loudest and rowdiest fans as they are solid fans of the fighter. Recently, Senator Vicente “Tito” Sotto II strongly suggested that local government should provide means for their constituents to take part in the fight by watching it together for free. You can now check if your barangay will sponsor the telecast of the fight. If you decide to go, be ready to have a time n your time. 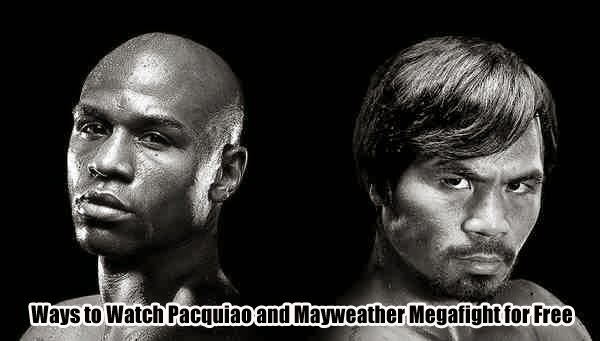 There are some sites in the Philippines that will offer online live stream of the megafight. While this seems to be a good option as you can watch it live in the comforts of your home, expect ads to pop up from the video. Do not be surprise if the video lags or goes unstable as the streaming still depends of how reliable your data connection is during the fight. Aired by GMA network’s DZBB Super Radyo, they are licensed to officially broadcast the fight live on AM radio straight from Las Vegas. When all video options fails, or if you really want to be one of the firsts Filipinos to know the game’s result, tune in to 594 kHz on the AM band.